A pipeline breach spewed more than 50,000 gallons of oil into the Yellowstone river, according to Montana officials who claim that they’re not aware of any threats to public safety as a result of the spill. According to the Bridger Pipeline Company, the spill occurred about 10am on Saturday near Glendive, Montana, estimates placing the amount of oil leaked between 300 to 1,200 barrels. Following news of the spill, the company in charge of the 12in-wide pipeline closed it shortly before 11am on Saturday, but even so a considerable amount of oil got spilled into the water. Dave Parker, a spokesman for Governor Steve Bullock, said that water in contact wit the spill was quickly frozen to minimize any risks towards public safety. This isn’t the first time the Yellowstone was polluted following an oil spill. The most recent event of this sort happened in July 2011 when 63,000 gallons of oil washed up along an 85-mile stretch of the riverbank, after an Exxon pipeline broke near Laurel. Exxon Mobil is facing state and federal fines of up to $3.4 million from the spill. The company has said it spent $135 million on the cleanup and other work. It’s safe to say that similar measures will apply to the company responsible for the Glendive spill. The incident comes in the heat of controversy over the Keystone pipeline route, which if approved and completed would total 1,179 miles and could carry up to 830,000 barrels of oil from Canada’s tar sands regions to refineries in the Gulf Coast and Midwest each day. A study last year found that the pipeline could result in four times more greenhouse gas emissions than the current State Department estimate, and President Obama has said that he would only approve Keystone XL if the project wouldn’t “significantly exacerbate” the problem of greenhouse gas emissions. 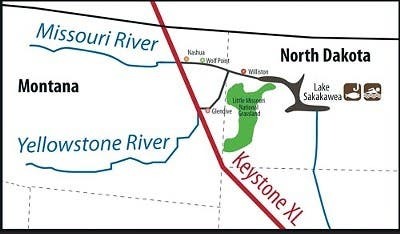 The Keystone pipeline would pass through both the Yellowstone and Missouri rivers.